With only 10 weeks until the Rhinos home opener at PaeTec Park, Rhinos President Frank DuRoss takes some time out of his very busy schedule to answer some questions about the new home of the Rhinos. 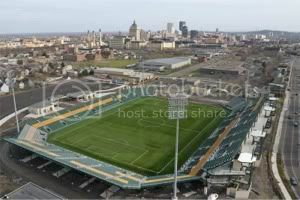 SoccerSam.com: What has been tougher to deal with lately, waiting for the word from Albany on further funding for PaeTec Park or everyone asking you about the further funding for PaeTec Park? Frank DuRoss: It has been tougher waiting for the word and dealing with all the political issues than responding to all the questions regarding future funding for PTP. SS.com: Do you think that the night of June 2nd will feel almost like Christmas Eve because you'll have this huge gift to Rhino fans that you are waiting to unveil? FDR: I am sure June 2nd will be a sleepless night, like most Christmas Eve's, but quite frankly it should be a night of relief because I will have done all I could possibly due for the June 3rd opener. SS.com: What are some things that you can't wait to see on opening night? FDR: The total excitement of our fans who have been with us for the last 10 years at Frontier Field, is probably the most anticipated sight I have. SS.com: A lot of people tend to get a little confused when it comes to the talk about phases for construction. So what can people expect to be read on opening night, what will still be a work in progress, what might not be ready until opening day 2007, and what parts of PaeTec Park are still in the planning stages? SS.com: Is there going to be a team store at PaeTec Park on opening day? FDR: There will be a temporary team store located in a 12 X 60 ft. trailer on site, along with 3 portable merchandise stands. SS.com: Another popular topic when it comes to PaeTec Park is where will people park. Especially on nights, like opening night, when there will be a Rhinos game and a Red Wings game on the same night. Will parking be as easy to find as it was at Frontier Field? FDR: We will be unveiling the parking plan within the next 30 days but it is fair to state that we have been accumulating acres of adjacent land to compliment the already built parking lots. I believe that we will have more parking adjacent to PTP than there currently is at Frontier Field. SS.com: Another popular topic about PaeTec Park are the concessions and whether there are going to be local vendors like Dinosaur BBQ and Rohrbach's at PaeTec Park. Is there going to be plenty of "local flavor" at PaeTec Park? FDR: We will have an outside concessionaire handling all the food and beverage sales. We are currently in negotiations with numerous local vendors to give the stadium a local/regional feel. SS.com: Whenever there is talk about PaeTec Park, talk about a possible move to MLS is never far behind. What needs to be done to make PaeTec Park "MLS-ready" and is there a timeframe in place for that work to be completed? FDR: For PTP to be MLS ready, we simply need to complete all the work and amenities we currently have planned in Phase 2. It is our goal to have all of Phase 2 work completed prior to the opening game in 2007. SS.com: There has been a lot of debate lately about retiring numbers for the Rhinos. Is there a plan to have a Walk of Fame or a Rhinos Hall of Fame to honor former Rhino greats like say Tommy Tanner, Scott Schweitzer, and Doug Miller? FDR: We will have what we have referred to as Dedication Lane which is a designated area in the entranceway of PTP where families and corporations can buy commemorative bricks or tiles. We will designate a specific area as our Rhinos Walk Of Fame. Although our franchise is only 10 years old, we certainly believe that we should honor certain former Rhinos Players and induct them into the Rhinos Hall of Fame. We are working on the process of how to chose inductees and will have an announcement during this upcoming season. SS.com: How excited are the players and coaches about the opening of PaeTec Park? Has it made it easier to recruit players this offseason? FDR: The current players and coaches are extremely excited about showcasing their skills at PTP. This year's team is significantly different than last year's squad due to player retirements, injuries and coaching decisions. PTP has sparked the interest of various potential players and has helped us to sign the current team. SS.com: Does the team have an attendance goal for this season? Other than taking back the attendance title from Montreal, of course. FDR: It is our goal to increase our attendance over last year's numbers and to work our way to the top of USL attendance chart. SS.com: In 2004, you were able to get the opening date of the US Women's National Team's Fan Celebration Tour after they won the gold medal at the Athens Olympics. Should we start planning now for the first leg of the US Men's National Team's Fan Celebration Tour after winning the World Cup in Germany 2006 to be held at PaeTec Park? FDR: We would love to host both the USMNT and the USWNT at PAETEC Park. The USSF has been very happy with what we have done in the past, and we are hopeful of bringing some marquee National Team events to the stadium.